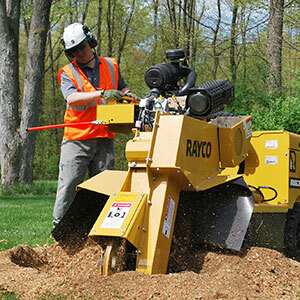 Rayco is adding electronic fuel injection (EFI) to its compact, self-propelled stump cutters. The new models RG37 Super Jr and RG37T Trac Jr will be powered by Vanguard 37-horsepower Big Block gasoline engines with EFI. Vanguard designed the new Big Block EFI engines to have more reliable starting characteristics and improved load pickup and fuel economy, Rayco said. The new RG37 Super Jr is available in two-wheel drive or 4-by-4 versions, while the RG37T Trac Jr rides on rubber tracks. Both models come standard with Rayco-exclusive features such as swing-out operator control station and hydraulic backfill blade.